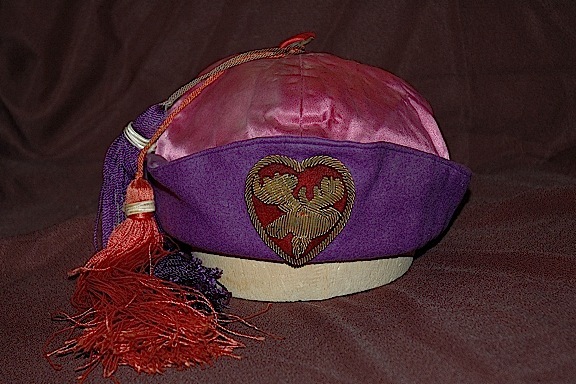 The Loyal Order of Moose (LOOM) have worn a couple fraternal hats over the years. The most unique, or perhaps disastrous, is the Tah, which is “hat” spelled backward. And indeed, it is kind of a hat turned inside out. It is…a terrible piece of haberdashery. They have also worn fezzes, at least in their Moose Legion units, and perhaps at the lodge level, as well, although I am not sure. The Moose Legion is a degree or unit in the LOOM that aims at higher social and charitable contribution to society. The Legion doesn’t wear any particular hat any longer, now keeping their distinctive piece as a medal worn around the neck. Moose fez/tah emblems are a red heart, usually in velvet, surrounded by bullion and with a bullion moose head in the center. Purple wool felt brim, lavender satin top, red satin button on top, with purple and magenta tassels dangling from it. A bullion Moose emblem over and around a red velvet heart. This tah (”hat” spelled backwards) is completely soft, no structure or shaping to it. Part of a large omnibus gift of hats, medals, and “stuff” from Burkley Grey. I was unaware of the Moose Tah before the gift of this piece. Is the Moose Legion Tah for sale? Where can we buy the Moose Legion Tah? I don’t (currently) sell from my own collection, but these do occasionally come up on eBay, if you watch out for them.